How do I raise the pH of my well water? What is a good pH for well water? So if your well water pH is BELOW 7.0. It is acidic. And you should correct it. Also if it is below 6.5, it is HIGHLY acidic. The EPA says never to drink water below a pH of 6.5. Because that is the safe drinking water standard. Our opinion is that you should not drink water below 7.0. Because it is acidic water. So we believe that anytime your water is acidic, it is trying to eat away at anything it touches, including pipes, fixtures, fittings, lead etc and dissolve it into the water. Also, when you have copper pipes with low pH water. You will probably also see blue or green staining on sinks and fixtures. And that is actually the copper from the pipe melting or dissolving into the water! So you should not drink water with high levels of copper. First of all, you should start with testing your pH. Additionally, you can take it to a pool supply/hot tub store for testing. And you can send it to us for free testing. Also, you can buy a pH test kit. But DO NOT use any sort of test "strips" to test your water. Because though it may seem easy, they are almost never accurate enough for properly sizing well water equipment. It is also not a good idea to rely on in-home sales companies for testing accuracy. Because they can alter the results to increase their chances of making a sale. What is the difference between using an acid neutralizer tank, or using a chemical feeder system? So a chemical feeder system is cheaper in cost. But it requires a few minutes of maintenance each month. On the other hand, an acid neutralizer tank is a bit more expensive. But it requires less maintenance. And a chemical feeder is more versatile. Because it can raise pH and disinfect the water. But a chemical feeder normally can't raise really low PH as well as acid neutralizer tank system. Of course, if the pH is extremely low, such as in the fours and fives. You may actually need two back washing acid neutralizer tanks. But most people don't. So a chemical feeder uses a small mixing tank that holds about 15 gallons of water. And the average family will make up a mixture in this tank about once a month. And it is very easy to do. Because you simply fill the tank with water. And then you add a powdered mineral, a scoop at a time, until you hit the desired pH. That's it! And that mineral is usually pretty inexpensive to use when correcting a marginal pH. Also, you can always have us deliver it right to your door. In addition, another benefit to the chemical feeder is that you can also add two or three cups of Clorox bleach to the mixture. And it will keep things from growing in any filters or tanks you may have. For example, if you have any iron or iron bacteria, they can no longer grow things in the filter tank or the pipes leading to the tanks. Also, you can disinfect the water with Clorox and then add our Terminox iron, sulfur and manganese filter. Because the Terminox then removes your iron, iron bacteria, sulfur and manganese. And it eats the Clorox like candy! Above all, it removes the chlorine (Clorox) naturally without the use of expensive and messy carbon replacement and other filters. So there is no ongoing maintenance costs like when you buy from in-home sales companies. Even more important to most home owners, is there will be no Clorox in your home or septic normally. And that makes this more of an earth friendly filter. Another benefit to a chemical feeder system, is that you can also target pH. That is to say, you can add enough mineral to make the pH 7.2. And then you can add a little more and make it 7.6. This can certainly come in handy. * What does 110v and 220v pumps mean? Simply find out if the well pump is a 110v pump or a 220v pump, due to the fact the well pump and your new chem pump need to be the same voltage. So the 110v pump will have a single switch on the breaker box that is for your well pump. And if you have a 220v pump, you will have a double switch on your breaker box that goes to your well pump. Once we know that, we will know which voltage chemical feeder pump to send to you. 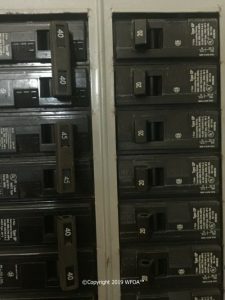 Example of a Breaker Box with 110v and 220v switches . In the picture above, the 110v switches are on the right. And the 220v switches are on the left. You can clearly see the 110v are single switches. And the 220v are double switches. So you want your new chemical feeder to be the same voltage as the switch on the breaker box that connects the well pump you have. That is to say that if you have a 110v well pump, you would want a 110v Chemical Feeder System. So if you're not sure exactly what you need, just call in and ask a friendly water technician to help you. * Why would I need a solution tank? In order to use a chemical feeder pump, you also need a solution tank to mix your water and soda ash to raise your pH. This is also the situation where you would normally add 2 or 3 cups of Clorox as a disinfectant. OUR American made Chemical Feed Systems are designed in such a way that you can use both chlorine and soda ash in the same mixture. So if you're not sure if you need Clorox, just ask a friendly water tech either now, or when you are installing. And remember that if you follow the chemical feeder with the Terminox® Filter, there will be no chlorine in your home or septic. The Terminox® eats it like candy! The chemical injection system comes complete with pump, hoses, fittings etc. And all you will need in addition is the mixing tank, which is listed below. And remember you can't just use any container to mix water and chlorine. So you will need something that is specially made to hold strong chemicals like chlorine, such as our durable mixing tank. Above all, you don't want some cheap plastic or metal tank to break down into the water and ruin your pump. And that would not be covered in the 2 year pump warranty. *Are your pumps made in China? NO! We have each pump custom made to order right here in the good old USA. That's because foreign made pumps do not seem to last like high quality American Made pumps such as ours. And definitely do not work as well as ours when also adding more than one thing to our mixture. So we often add as many as THREE items to our mixture, including water. That means you should not need TWO pumps. And our pumps are made to be virtually maintenance free. And they are simple and easy to install and operate. Because they are self priming, you are not always fighting them to hold their prime, like the cheap aftermarket foreign pumps. Our pumps are sold to you direct, with no greedy middlemen or commissioned sales people involved at all that results in increased pricing. So you get American Made quality at discount pump prices. And our American Made pumps are manufactured to our exact specifications, which means they are made for exactly what you are using them for. * Why would I need a flow switch? Normally the only plumbing that is necessary when installing a chemical feeder system. Is to simply put a "T" in the water line BEFORE the pressure tank. But if you don't have a pressure tank, or if you need to put the "T" for the chemical feeder AFTER your pressure tank. You may also need a flow switch. So if you need a further explanation of whether or not you need a flow switch. Just give one of our friendly water technicians a call. * What is soda ash? The chemical name for soda ash is sodium carbonate. But be sure you never mistakenly use sodium bicarbonate. Because that is pot ash, and will damage your filters over time. And the kind of soda ash we use is specially formulated for use in American Made chemical feeder systems. Don't use the cheap swimming pool additives as this is not good for the chemicals feeder, and it often will results in mineral failures in your iron filters, and other well water filters. Also what we use is a food-grade product that is completely safe. It is commonly used in everyday household items, such as pure soaps for instance. And another good benefit to raising your pH using soda ash, is that it is far less likely to raise the hardness of your water as noticeably as an acid neutralizer tank might. So if you don't have very hard water, you likely still would not need a water softener after using a soda ash injection system such as this. Using a backwashing acid neutralizer to correct low pH in well water. First of all, using a backwashing acid neutralizer tank is a very popular way to increase your pH, especially when you don't want to deal with ongoing monthly maintenance. So normally, you would simply add a bit of mineral through the port in the EZ Fill tank. Another plus is that most people only have to do it every 10 months, or a year. So how often really depends on how low the pH is, how big the tank you have is and how much water you use. But normally, most people add mineral about once per year on average, when the tanks are properly sized. The cost for acid neutralizer mineral is usually $25 to $50 per year. But if you have really low pH in the 4s or low 5s, it could be a bit more expensive on a yearly basis. Another big advantage to backwashing acid neutralizer tanks, is that you can use more than one tank on problem water with severely low pH. On extremely high acid water, you can use one tank with one type of mineral (Calcite usually) to get it up into ranges where we can work with it. And then you can add another tank with a different mineral (Calcite plus) that takes it the rest of the way up to where it needs to be. We rarely have anyone that needs two pH neutralizer tanks. But it certainly does happen on occasion. The trick is to properly test your water to begin with. So that you know what you likely need to do. The good news is that we are really good at this. And we can custom make everything for just the kind of water you have. There is no extra charge to make it from scratch. All American premium quality at BUDGET prices. Calcite plus is for very low pH ranges and should be used only in conjunction with another acid neutralizer or a soda ash injection system. Always talk to a friendly water tech, rather than guess at it. Sometimes people on a budget will put in a calcite tank first to see if they can get the pH up with that. And then add a calcite plus tank later if they see it is neccesary. NEW! Our new "EZ FILL" Tanks make adding Calcite or Calcite plus to your new acid neutralizer a snap! The side port with cap makes adding minerals to your tank more convenient. Just unscrew the cap and pour minerals in! PLEASE NOTE: Be sure to watch out for people selling "Upflow" tanks with no electronic control. They may work ok at first, but eventually they get overloaded and bogged down with dirt and debris, as they can't clean themselves effectively. Acid Neutralizer tanks simply MUST backwash. This third method is not recommended by as the best solution normally. However, some customers have had success when they opted to mix Calcite plus and Calcite media (mineral) in the tanks. They have used these mixed mineral tanks due to space restrictions or other issues when it was not possible to use two separate tanks each with separate types of media. One with Calcite and the other followed with Calcite Plus, which is always the recommended way. We do not guarantee mixed mineral tanks. Be very careful of water treatment dealers who sell these mixed mineral tanks as a "standard" approach to water treatment. It is only for extreme situations where you have no alternatives or for experimental purposes. Our new "EZ FILL" Tanks make adding Calcite or Calcite plus to your neutralizer a snap! The side port with cap makes adding media to your tank more convenient. Just unscrew the cap, pour media in and close! How do I know which size is right? Is it easy to install? Do I need a plumber? Most homeowners can actually do it yourself (DIY) these days. And just about everyone knows a friend or family member who is handy and will do it for a free meal, or a six pack of beer. I think we all know someone like that. (Just be sure not to give him any beer until he's finished!) Now there are "quick connect" kits available for installing to your existing water pipes. So you don't have to be a plumber to do it. But any plumber or handyman should be able to install in minutes. Anyone can watch our step by step videos. No torches or special tools are required with our equipment normally. So it should not be expensive at all to install, whatever you decide. And furthermore, we often see many housewives and seniors do it. We have expert USA based friendly water techs to help you 7 days a week by phone as well. A backwashing Acid Neutralizer tank commonly uses calcite, or other minerals, to dissolve slowly into the water. The dissolving mineral raises pH as it dissolves. This method using calcite normally works well down to about 5.5 pH. What types of well pumps will they work with? The solutions for raising pH with different types of well pumps are normally the same for the most part. You can use either a backwashing acid neutralizer or a chemical feeder. Regardless of whether you have a submersible well pump (a submersible well pump is down in the well itself). Or if you have a jet pump. A jet pump is what you call a pump that is above ground. And the solution is the same, whether the well has a conventional well pump, constant pressure pump, variable speed pump or geothermal well pump. And the more expensive the pump, the more you should correct your pH as quickly as possible. Can acid water damage copper pipes? So the telltale signs of acidic water (if you have copper pipes) are blue or green stains in the bottom of your sink or tub. In many cases. If you don't correct this water. It can start causing pinhole links in the copper pipes. Not to mention stink, drain and fixture issues. Even if you don't have copper pipes, and have plastic, PVC or PEX type pipes. If these signs appear, or if you suspect you have acidic water. Then a simple pH test will tell you whether your water is acidic or not. You can get a pH test kit at almost any pool supply store. Or you can order one from us. If you have iron and low pH water. If your water has a pH of 7 or less. Then it is considered acidic and it should be treated. If you intend to remove iron from the water. Then the pH should be at least 7.5 or higher. Any good iron removal filter for well water will require 7.5 or higher pH. Consequently remember to never use any sort of iron filter that says it also raises pH. The manuals for raising pH, and the minerals used an iron filters. Cannot be used in the same tank. It makes the minerals inside unstable and ever changing. Beware of anyone who would suggest such a thing. A calcite backwashing pH increasing system uses crushed and screened white marble limestone which is dissolved in the water to neutralize acidic water. The kind we use is specially made for premium quality and efficiency. DO NOT buy aftermarket calcite, or buy from swimming pool supply stores. A lot of slick willy type dealers use that sort of minerals to CREATE service calls. If your pH is below 5.5 then our "Calcite plus" tank, in conjunction with a Calcite Tank might be the proper application. A Calcite Plus system uses another mineral which, like Calcite, is dissolved in the water. Only it dissolves faster. Consequently, it tends to work better on really low pH well water. PLEASE NOTE: Whether you are using Calcite, or Calcite plus, they may increase hardness in the water. And a water softener may become necessary as a result. 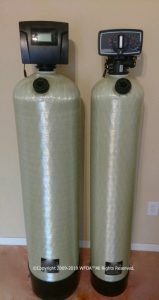 In these cases you may need a water softener after the neutralizing filter to remove hardness. It is alway best to check the hardness levels of the water, once the pH raising tank is installed. A chemical feeder is usually less likely to substantially raise hardness in well water. Can I use an acid neutralizer as an iron filter? Absolutely not! Be careful of anyone who would suggest such a thing. Clear water iron will go right through it. 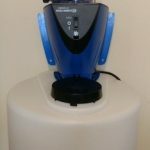 Consequently, if you have a water softener, or some other filtering system after it. You will damage the softener minerals over time creating potentially expensive service calls. How much mineral will I use? How much mineral needs to be added to the tanks depends on how acidic your water is, and the amount of water that you use. It is best to re-check your pH level occasionally. A low priced pool "drop" pH test kit is usually all that you will need (no test strips!). You don't want to wait until the pH drops to add. When you fill the tank for the first time, you will know how full it is. For most people you add new mineral when the mineral level drops about 20%. We make it very easy to tell when you need more. Once you need to refill it the first time, you will know how long to expect it to last for you after that. It truly is simple. One of the nice features of the way acid neutralizers work is that there is no adjustment necessary. On our units, the more aggressive the water is, the more mineral that will be dissolved by the water. And you can learn more about common sales tactics and things to watch out for on our Compare Methods page. 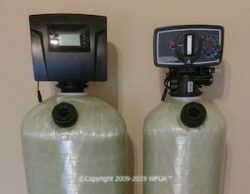 To eliminate acid water and to help iron filters, water softeners and many other water filtration systems work at maximum efficiency, you have a few options on how to do that. To raise pH, you can use either a chemical injection pump that injects a small amount of soda ash. Another option is use a backwashing acid neutralizer. There are advantages to both of these methods. The best method for your specific application would depend on many factors. Such as the pH level. And whether or not you have any iron bacteria or organics. So there'll always a lot of variables as we try to raise pH. That is why we cannot guarantee any Chemical Feeder or Acid Neutralizer will absolutely rise your pH exactly where it needs to be. Sometimes there is a little trial and error involved. So that is not our fault. And it is also not your fault that well water can be so finicky at times. That's just the way it is. Most of the time we get it right the first time. As always, please do not hesitate to contact one of our industry leading technicians to help you decide which type of acid neutralizer is best for your needs. They will never ask you to buy anything or pressure you in any way. Please feel free to call us at 800-684-0979, or email us at info@waterfiltersofamerica.com for more information. 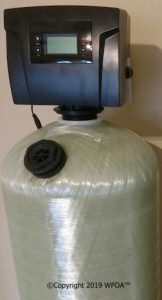 Water Softener - Used in water treatment to remove calcium and magnesium from the water to create soft water and prevent calcium or scale build up and to make soaps more efficient. Chemical Feed System - Used in water treatment to treat iron bacteria, organics, e-coli, coliform and to neutralize acidic water or raise pH. Reverse Osmosis - Used in water treatment to reduce the total dissolved solids (TDS) from the water creating pure, clean, great tasting drinking water. Commonly used to greatly reduce the sodium content after a water softener. Iron Filters - Used in water treatment to remove heavy metals, odors and colors. A good iron filter will remove iron, sulfur, manganese, taste and odor from the water. Dirt/Turbidity Filter - Used in water treatment to remove dirt, turbidity, sand and sediment from the water. Well Water Systems - Complete packages for well water treatment. Including iron filters, chlorine injection systems, retention tanks, water softeners, reverse osmosis drinking water systems and ultra violet sterilizers. Well Water Equipment - Where you will find pumps, pressure tanks, pressure switches and well water accessories for getting you well up and running.